"I am a work at home mom with a beautiful snuggy baby and one amazing preschooler. 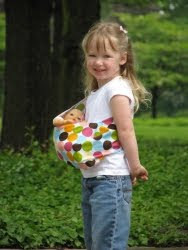 When my first daughter was born, I could not find any place to buy a sling, so I learned how to make them. I received so many comments and compliments about my slings that I decided that every mom needed to be able to get a sling. 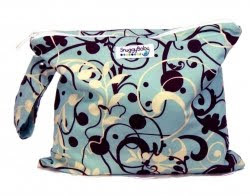 So I started Snuggy Baby to make it easier for moms to find beautiful, comfortable slings that they would love. It didn't happen overnight, in fact, I changed the design of my Ring Sling many times before I came across the perfect balance of fashion and comfort. This summer, I wore my 20 pound Snuggy Baby for 6 hours straight every week standing on concrete at a local outdoor market. I still carry my 3 year old around in a sling. No way I could do this without an extremely comfortable sling. I built the perfect Ring Sling for myself, and I would love to share it with you. What started as an idea to offer 6 different patterns of ring slings has grown into a large handmade business with several product lines. Take a look around. I hope that you find something that you love." It has unlimited uses between now and April 15th. 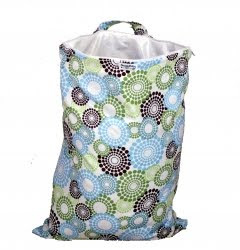 Currently, SnuggyBaby is running a closeout of discontinued fabrics and last years patterns where many items are 50% off. You can buy a closeout wrap and use your coupon, it is possible to get a wrap for $26.00, maybe under $30.00 total depending on where it has to ship to! I like Snuggly Baby on FB (erin brady), follow on twitter (@bradywadie14), and a product I love is the Floral Fireworks Prestige Ring Sling! I follow Snuggy Baby on FB and twitter! I like the Turquoise Dream Baby Wrap! ntered Yoga By the Dozen giveaway! I entered Tazzini Stainless Steel Water Bottle!